Through our partner company we offer design, installation and maintenance of fire sprinkler systems as well as consultancy to inform you about which fire sprinkler system is best for your environment. Safesmart and our NSI Gold certified sister company Trafalgar Fire have established a partnership with a leading specialist fire sprinkler installation company that is full certified to install fire sprinkler systems. In partnership with this specialist company, our IOSH, NEBOSH, BAFE, & GIFireE qualified Fire Safety Consultants and Fire Safety Engineers can provide expert advice about the type of fire sprinkler system that is best for your environment. Our fire sprinkler installation partner is FIRAS certified and holds this separate accreditation for Commercial, Residential and Domestic fire sprinkler installation. They have over 30 years’ experience in fire sprinkler installation and are members of both The British Automatic Fire Sprinkler Association and The Residential Sprinkler Association. Sprinkler installations can be tailored and alterations can be made to suit design, time and budget constraints whilst ensuring safety, efficiency and affordability. Our partner can install all types of fire sprinkler systems ensuring they are appropriate for the environment they are going into. 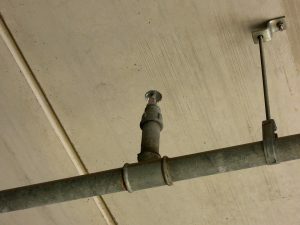 These fire sprinkler systems can be installed when there isn’t the possibility of pipes freezing. The sprinkler system is under pressure with water at all times. When the fire creates heat this activates the fire sprinkler head and water flows immediately onto the fire. 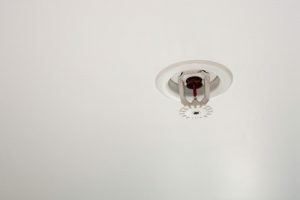 These types of fire sprinklers are usually installed where the accidental release of water may cause problems. For example if a fire sprinkler head is accidently damaged. Pre-action fire sprinkler systems are installed in areas like data processing premises and document or cold storage warehouses. The sprinkler system can only be activated by a combination of events i.e. the smoke/heat detection and the operation of a sprinkler in a fire condition. Pipes are filled with compressed air then water is only allowed to fill the pipes when smoke/heat is detected by the system. This helps to ensure that accidental release of water will not occur. There are several modes that these systems can operate in and these can be set up in the control panel system to suit a client’s exact requirements. For the reassurance of expertise in consultancy and installation contact us for a fire sprinkler installation quotation. Choosing Safesmart means choosing safety, efficiency and affordability.